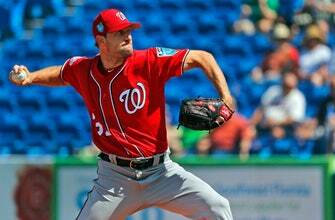 PORT ST. LUCIE, Fla. (AP) Tim Tebow made his first spring training start this year, struck out against reigning NL Cy Young Award winner Max Scherzer and then singled off Washington’s Erick Fedde in a 2-1 loss to by a New York Mets’ split squad to the Nationals on Friday. Batting fourth as the designated hitter, Tebow struck out on three pitches leading off the second inning. The 30-year-old former NFL quarterback singled on a first-pitch fastball in the fourth for his first hit of spring training. The 2007 Heisman Trophy winner reached on a fielding error by first baseman Jose Marmolejos in the seventh and is hitting .143 (1 for 7) in his second big league spring training.